This unusual formation was seen travelling east at about 2pm on a June day in 1999. Dennis Woodford, Obi Obi. aprox. 8:30 am. From a video which lasts about 10 minutes. A Morning Glory style wave was photographed at Caboolture airfield on the morning of the 8th of August around 7:30am. The description of the airmass as it passed over is identical to that of a Carpentaria wave in transit. Attached is the pics you SMS'd me which I have sucked out off my phone onto the computer. Can you let us know the following by return mail as there are a few of us interested to know what might have generated it. Also has any of the other local pilots ever observed this ?. Russell this multiple glory wave system was in W.A. and you might like to put Bernard's description on the website as this is unusual. He at one point observed 15 of them lined up. Direction and distance from Derby. Number of lines of waves in each encounter and alignment. Wind direction at the times of sightings. Was there a sea breeze the day before or early evening day before. Lift strength (climb rate at normal power and attitude settings). Estimate speed of waves across the ground. And a little story of the encounter would be nice. Ok, lets start with the weather conditions. I wont include the whole ARFOR but the bits i feel are most important. CLOUD - There were no significant low level cloud forecast. Approx. 0530 local i noticed 3 low level wave roll clouds passing over the airfield at quite a speed, maybe 40-60km/hr at a guess. Base at a guess was 500-1000ft. About half an hour later i was airborne in a cessna 206 headed north toward cockatoo island. By this stage the clouds were about 15nm north of the field over Point Tourment. They appeared to be travelling a track of approx 330 to 340 which basically equates to "up the King Sound". I climbed to 4500ft and flew over the top and experienced downdrafts before the clouds and updrafts following. These were at about 500ft per minute either way. I was trying to maintain my chosen level and was finding speed being 10-15 above and below the norm. I passed about 5 of these clouds before entering smooth air about 35nm south of cockatoo island. Having picked up passengers at cockatoo island i climbed to 6500ft and headed for broome. This track took me across the top end of the king sound and across more of these long low level clouds. Even at 6500ft the same updrafts and down drafts were felt only not to the same extent. It was here that i counted 15 extending down the King sound toward derby with spacing of 2-3nm at a guess. The time was about 0730 local. On the return trip to cockatoo island there was no sign of the clouds, the sun was up fully and they had burnt off etc. I havent seen this before in or around Derby. There has been sea breezes in the evenings, quite strong ones. The other thing is that this last week there has been a lack of seasonal thunderstorms in and around derby, only in the distance. I havent yet had the chance to speak to any long term pilots about it but will over the weekend. Hope that helps. You'll need a map to understand all. FYI there is the Grant ranges to the SSE of derby which might be worth looking into. The wind on the ground did increase as the clouds came over the airport but not by a massive amount. This photograph depicts a unique example of a roll cloud over Spencer Gulf, South Australia. 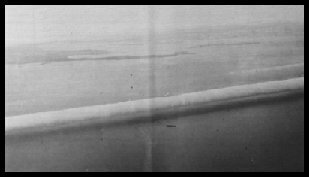 The picture was taken at 1.15 pm, 27 November 1977 by the co-pilot of an Airlines of South Australia aircraft while on approach to land. He estimated the length of the cloud to be 5 kilometres. The camera was pointing west and a further faint roll is just visible to the west of the main one. The ship near the centre of the picture was the Danny F, which was 230 metres long. This puts the thickness of the roll and the height of its base around that figure. A north-easterly airstream had resulted in humid sultry conditions over most of South Australia. with isolated thunderstorms a day or so before the event. An interaction of this air mass with a cooler south-easterly anti-cyclonic flow towards the South Australian coast undoubtedly contributed to the formation of this well-defined roll. From: Solitary waves & low-altitude wind shear in Australia, D.R.Christie & K.J.Muirhead, Aviation Safety Digest 123/1985. 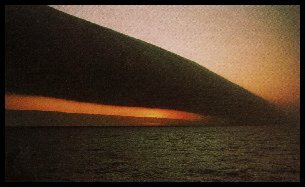 Roll cloud at sunset on the north-west shelf off Port Hedland. The cloud continued over the horizon. Photograph courtesy of Miss J. Statham and Dr M. W. Skinner.